The U.S. presidential election has slowly but surely captivated the world’s attention. A quick look through social media is enough to show that many people are waiting anxiously to see who will prevail in November. 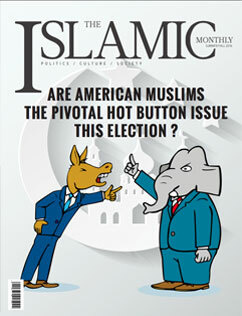 We at The Islamic Monthly have been following the race and exploring in detail what the process means for American Muslims and what we could look forward to with the next president. In this issue, we examine the election from a number of perspectives. Khaled Beydoun analyzes the Muslim element in the Democratic primaries, and how Bernie Sanders gave American Muslims a real voice in the political process. Mohammad Fadel also explores what it means to be Muslim while Trump dominates headlines and what we can expect with the Muslim vote. Asma Afsaruddin looks at the effect of being Muslim on the American political landscape and how in the end, we will see Muslims firmly entrenched in American society. Two authors, Roqayah Chamseddine and Manal Omar, detail both sides of the Hillary Clinton coin and how she is or is not suited for the office. One issue that has overshadowed these elections is that of Islamophobia. Davide Mastracci looks at the issue in Canada and how Muslims should use Canadian law to combat this problem. Elvedin Subasic sits down with scholar Ziauddin Sardar, who discusses the need for rethinking sharia, combating sectarianism, and the need for a reconciliation between Islam and the West. With Donald Trump rallying supporters behind the banner of nativism, Steven Zhou details across the ocean, China is also guilty of this trait. He introduces us to the tensions between the Muslim Uighurs and the Chinese state. Another issue that looms large in these elections is the threat of extremist groups, such as ISIS. Devan Hawkins looks at the very confusing battleground in Syria and the shifting alliances among all the entities that have their fingers in that pie. Trevor Aaronson takes us behind the scenes of the FBI’s investigation into the Somali community in Minnesota and the controversy behind how the government set up those it later prosecuted of conspiring with ISIS. With the election of the next president comes Barack Obama’s final goodbye to his eight years in office. Christopher Jackson looks at the president’s legacy from the perspective of an outsider and what Obama meant to people not American. Two larger-than-life figures passed away this year: Abdul Sattar Edhi and Muhammad Ali. Arsalan Iftikhar remembers Edhi, dubbed the Muslim Mother Teresa, who dedicated his life to giving everything he had to the poor in Pakistan. SpearIt juxtaposes the love and respect the world paid to Ali when he passed with the tragic mass shooting in Orlando that took place a week later, bringing the best and worst of American Islam in the headlines. Taylor Barnes brings us the story of two Syrian refugees in Brazil who have bounced around from country to country in a futile and desperate effort to reach Germany. Souheila Al-Jadda spoke with Jamal Dajani, a Palestinian American journalist, activist, and TV and film producer who was recently hired as director for strategic communications and media for Palestinian Prime Minister Rami Hamdallah. In other news, Wafa Unus talks about the hype behind online brain training programs and details her own experiences with the technology. Author Saadia Faruqi delves into the up-and-coming genre of Islamic fiction and its importance in the American Muslim consciousness. Kashif Chaudhry addresses the Sunni Muslim leadership in its discrimination and persecution of Ahmadi Muslims. And finally, Mai Nguyen-Phuong, a Vietnamese atheist, felt like she was on the sideline of Islam versus the West dialogue, then decided to wear a niqab, and follow Islam’s path of expansion throughout the centuries.